NASA continues to ramp up its development of its newest crewed space vehicle and launch system, the Orion Multi-Purpose Crew Vehicle (MPCV), which will be powered by the Space Launch System (SLS) in a bid to send humans beyond the confines of low Earth orbit (LEO) for the first time since the Apollo program ended in Dec. 1972. The first test flight of Orion integrated with the European service module stacked on top of SLS, Exploration Mission-1 (EM-1), is set to take place in late 2018. This mission, planned to send the uncrewed vehicle on a circumlunar trajectory, will stand as a test of the unified vehicle components (and will, undoubtedly, provide some cool views of the Moon). The U.S. space agency announced that it will soon commence testing of the European Space Agency (ESA)-supplied service module, which will begin with the delivery of a crew module adapter late this month, followed by the arrival of a test version of the service module in October. The testing will take place at NASA’s Plum Brook Station, which is part of the agency’s Glenn Research Center located in Sandusky, Ohio. ESA is responsible for developing and fabricating the service module, which is described as consisting of an aluminum lithium alloy; NASA added that the module will be 13 feet long and 16.5 feet in diameter. The design of this module is heavily influenced by a previous ESA vehicle, the Automated Transfer Vehicle (ATV). That particular vehicle was responsible for ferrying supplies to the International Space Station (ISS), and was recently retired from use. 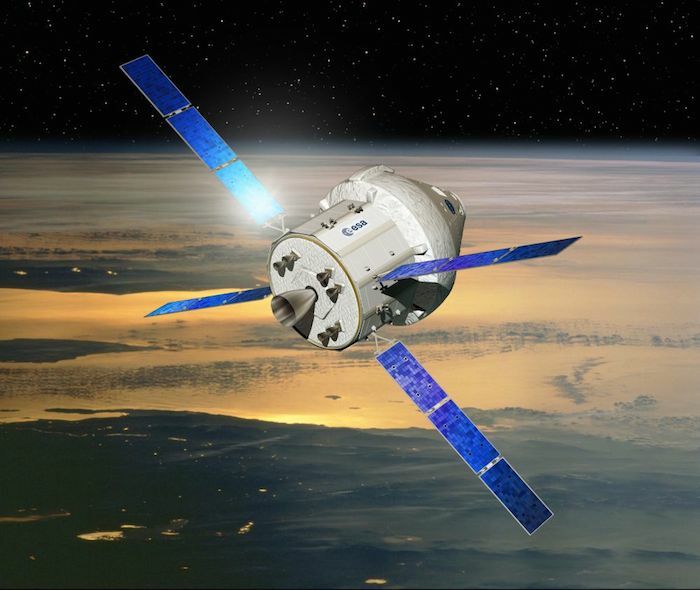 While Europe’s cargo vessel has passed into history, its hardware heritage is alive and well in Orion’s service module. ESA is using technologies from the ATV—for example, a similar solar array design—in its design. When fully deployed, these arrays will span an impressive 62 feet. ESA has used its “heritage” designs for other spaceflight applications in the past; for example, the design of Spacelab, which flew first on space shuttle Columbia in 1983, contributed heavily to design of the Columbus module on the ISS. The service module is being built and developed by AirbusDS of Bremen, Germany. NASA is also contributing to service module development. It announced that it will provide ESA with one of the Orbital Maneuvering System (OMS) pods from the space shuttle era to be “upgraded and integrated” into the service module. NASA further stated, “The OMS engine that will fly on EM-1 had previously flew on 19 space shuttle missions and performed 89 burns.” Lockheed Martin, NASA’s prime Orion contractor, will further contribute by fabricating the crew module adapter essential in connecting the crew module to the service module. 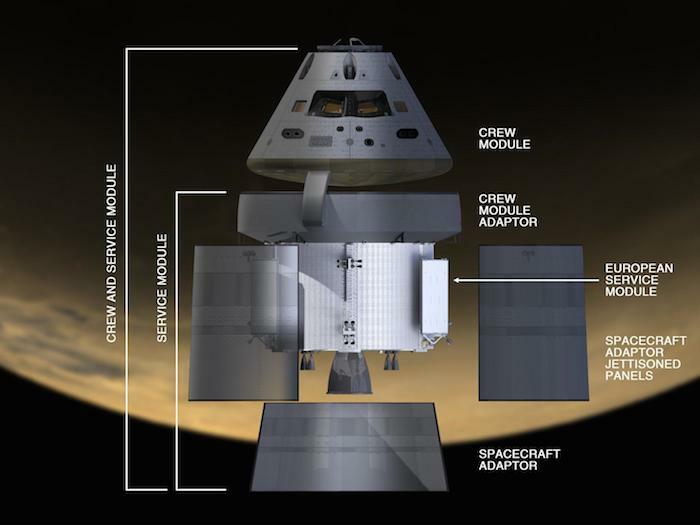 Late this month, Lockheed will deliver a test version of the crew module to the Plum Brook facility; in October, a test version of the service module will be delivered to the same site. There, a massive 22-foot-wide “shake table” will be employed to simulate launch conditions. These tests will determine how well these components “stand up” to the forces generated by a powerful launch. 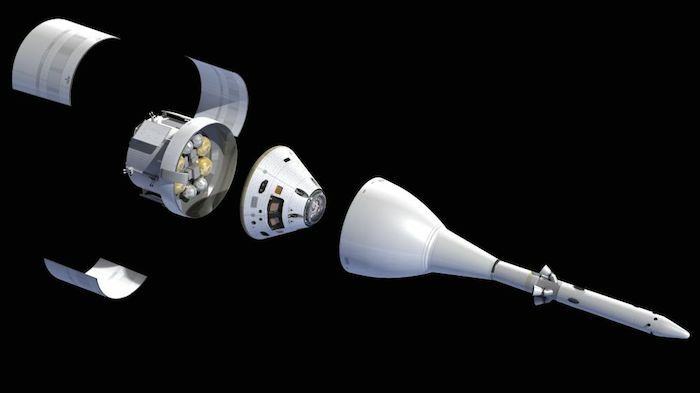 NASA also stated that Lockheed is building three fairing panels which will be used to protect the module, and the adapter that will connect the service module to the SLS vehicle. Joel Kearns, manager of the Orion Program’s ESA Integration Office, was enthusiastic about this upcoming round of tests. “Orion’s service module is at the heart of successful future missions into the solar system. It contains all the air, nitrogen and water for crews, in-space propulsion, and batteries and solar arrays to generate power, so it’s an essential element of the spacecraft. We’re testing one piece at a time as we integrate the elements so we can look at our models, determine how the vehicle responded, adjust as required and perform additional tests if we need to,” he underscored. This testing is set to take place throughout most of next year. NASA added that following these rounds of testing, “[T]he stacked structural test articles will be sent to Lockheed Martin’s facility in Sunnyvale, California, where hardware and software simulating other parts of Orion will be integrated before undergoing additional structural tests.” In January 2017, ESA will send the service module to be flown on EM-1 to NASA’s Kennedy Space Center (KSC) in Florida, where it will be integrated with an Orion vehicle. These two essential components will be sent to Plum Brook Station for further tests, then will be shipped back to KSC for further processing, ostensibly to be mated with SLS. In addition, tests involving the launch vehicle’s “hydrogen sparklers,” meant to prevent an explosion caused by excess hydrogen build-up at the base of SLS, took place on May 5th at the U.S. Army’s Redstone Test Center on Redstone Arsenal in Huntsville. Engineers are also continuing to analyze the test results from the Qualification Motor-1 test fire (QM-1), which took place at Orbital ATK’s test facility in Promontory, Utah in March. The five-segment solid rocket boosters to be used on SLS will be 20 percent more powerful than their counterparts used during the space shuttle program, and are being designed by Orbital ATK. As astronaut Scott Kelly orbits overhead Earth in a marathon mission in an effort to study the effects of long-duration flight on the human body, engineers on both sides of the Atlantic on Earth are busy developing Orion, its service module, and its heavy-lift launch vehicle, so that humans may one day conduct longer missions to asteroids, Mars, and other deep space targets.